Saudi Arabia's foreign minister has said funds found in Malaysian PM Najib Razak's personal account were a donation, say Malaysian state media. Last year, the Wall Street Journal accused Mr Najib of corruption, claiming that the $681m (£478m) had come from troubled state fund 1MDB. 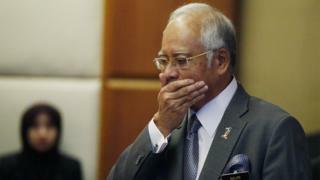 Mr Najib has faced repeated calls to step down as prime minister but has been cleared of wrongdoing. He said the Saudi statement confirmed what he had always maintained. Malaysia PM in the clear? The 1MDB fund was set up by Mr Najib in 2009 to pay for major new economic and social developments in Malaysia. Last July, Malaysia's then-Attorney General Abdul Gani Patail linked the $681m in Mr Najib's account to companies and bodies which had ties to 1MDB. Mr Patail was replaced, and, after an investigation, his successor cleared Mr Najib of corruption, saying that the money was a personal donation by the Saudi royal family to the prime minister's private bank account. Saudi Foreign Minister Adel al-Jubeir, speaking to reporters at a summit in Istanbul, confirmed this, according to Malaysian state news agency Bernama. "We are aware of the donation and it is a genuine donation with nothing expected in return. We are also fully aware that the attorney general of Malaysia has thoroughly investigated the matter and found no wrongdoing," he said. "So, as far as we are concerned, the matter is closed," Mr Jubeir said, after a meeting with Mr Najib on the sidelines of the summit. The fund has been dogged by allegations of corruption. Last week, a Malaysian parliamentary enquiry found its entire board 1MDB had been acted irresponsibly, and called for an investigation into the former chief, although it did not implicate Mr Najib. A Swiss investigation into 1MDB was opened last year, citing "suspected corruption of public foreign officials, dishonest management of public interests and money laundering". Regulators in the US and Hong Kong are also reported to be investigating 1MDB.